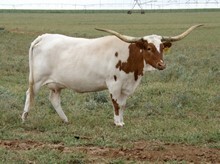 A beautiful 81.3750" TTT, cow, correct in every way....size, color, conformation and bred for horn. Sharp Abigail has excellent mothering ablilites and gives us a calf every year. In her pedigree are 83.50" TTT, RHF Sharp Shooter, 70"+ TTT, RHF Celebrity Status, 88.3250" TTT and 108" TH, Top Caliber, 73" TTT, Burnin Daylight, 78" TTT, Hunts Command Respect, Hashbrown, not least of all the legendary JMC Phenomenal Abigail and Lady Lite. All of Sharp Abigail's offspring are Millennium Futurity eligible.